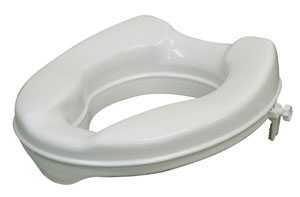 This moulded toilet seat raiser offers a great solution to those that have difficulty in getting on and off a standard toilet. The raiser has adjustable screw clamps secure the raiser to the porcelain toilet bowl. Specifications: Safe working load with 190kgs and available in 3 heights and come with or without a lids.